Junior Financial Analysts support the Senior Financial Analysts in analyzing the financial statements and transactions of the company. Their job role is involved in researching the economic conditions against the company’s fundamentals, thereby, recommending areas of improvement in the organization’s business. To be a Junior Financial Analyst, you should have a bachelor’s degree qualification in Commerce, Mathematics, Statistics or Accountancy and proficiency in Accounts Receivable, Accounts Payable, Books of Records, vendor agreement, investment schemes, etc. 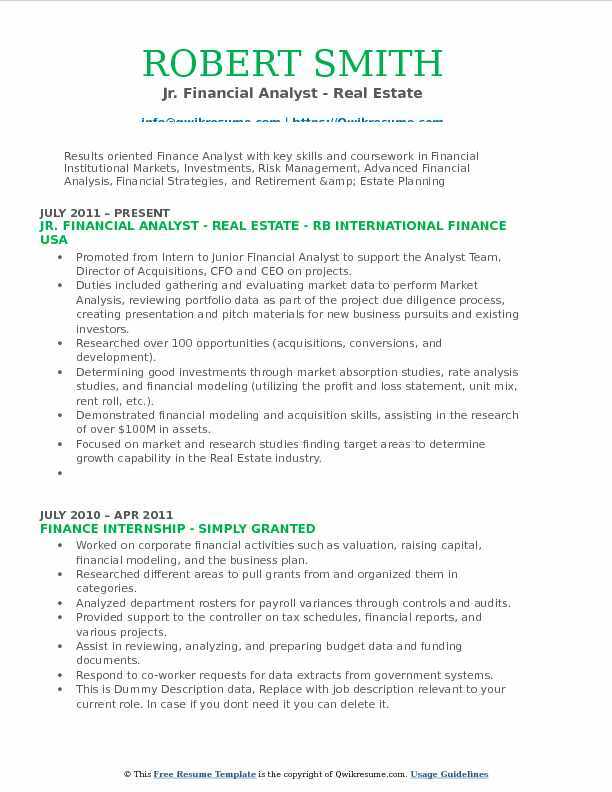 Though the positions of Junior Financial Analysts are limited the employers look for skills like computer literacy, financial and accounting proficiency, analytical thinking, organizational behavior, quick learner, etc. 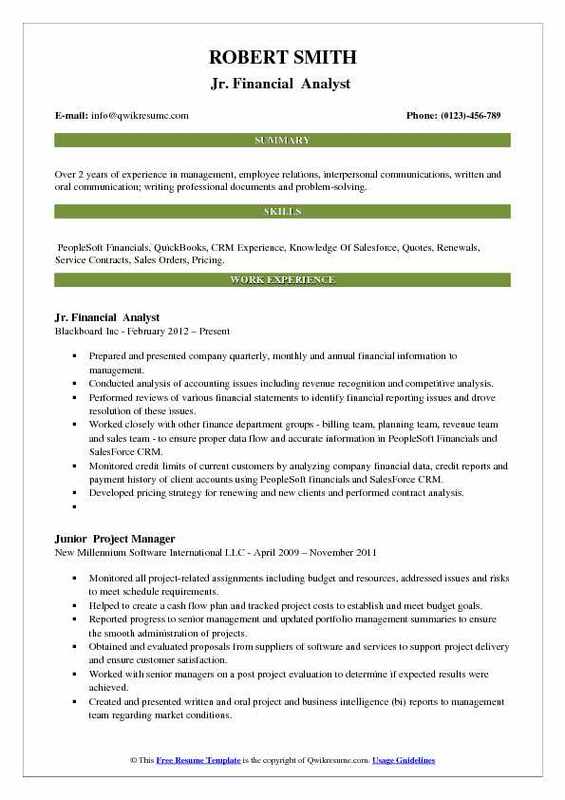 The best sample resume for the post of Junior Financial Analyst Resume has been drafted based on the requirements and the skills that the employers seek from the candidates. 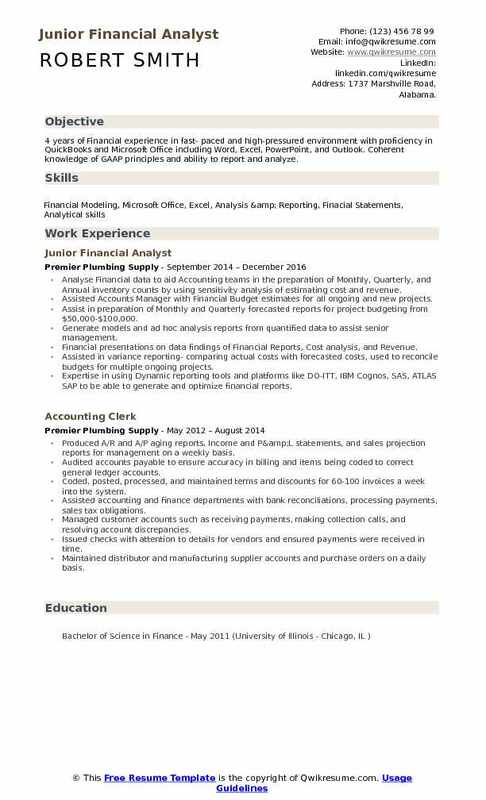 Objective : 4 years of Financial experience in fast- paced and high-pressured environment with proficiency in QuickBooks and Microsoft Office including Word, Excel, PowerPoint, and Outlook. Coherent knowledge of GAAP principles and ability to report and analyze. Analyse Financial data to aid Accounting teams in the preparation of Monthly, Quarterly, and Annual inventory counts by using sensitivity analysis of estimating cost and revenue. Assisted Accounts Manager with Financial Budget estimates for all ongoing and new projects. Assist in preparation of Monthly and Quarterly forecasted reports for project budgeting from $50,000-$100,000. Generate models and ad hoc analysis reports from quantified data to assist senior management. Financial presentations on data findings of Financial Reports, Cost analysis, and Revenue. Assisted in variance reporting- comparing actual costs with forecasted costs, used to reconcile budgets for multiple ongoing projects. Expertise in using Dynamic reporting tools and platforms like DO-ITT, IBM Cognos, SAS, ATLAS SAP to be able to generate and optimize financial reports. 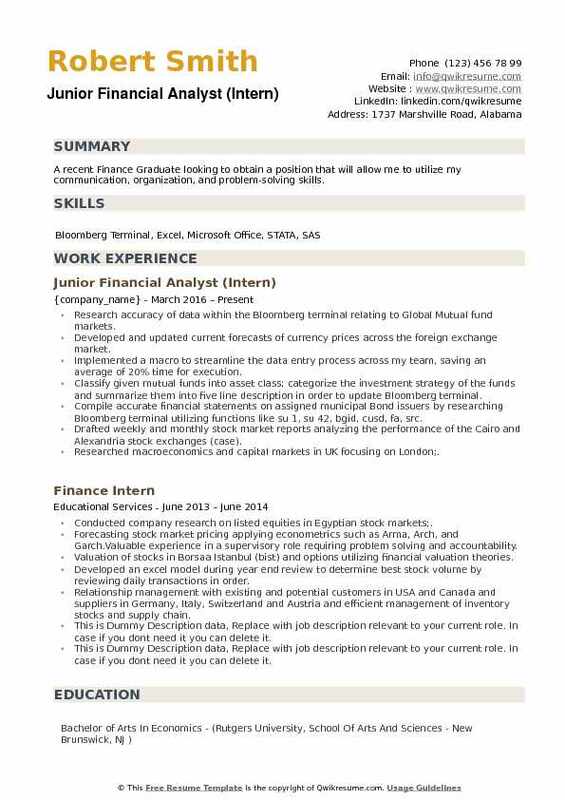 Objective : Ambitious and hard working finance graduate who holds proven analytical, interpersonal and technical aptitude along with firm underpinning in finance, customer service, and banking seeking work in an organization that is able to provide structured and comprehensive career growth potentials. Consolidated and Analyzed financial data, taking into account company's goals and financial standing. Coordinated with Finance team members to analyze financial information and provide forecasts as required on a monthly and quarterly basis. Prepare daily modeling, financial analysis and reporting, monthly charts, tables and other exhibits as requested. Provided timely, relevant and accurate reporting & analysis of the results of the division's performance against historical, budgeted, forecasted and strategic planning results to facilitate decision-making toward the achievement of the budget and strategic plan. Demonstrated appropriate understanding / working knowledge of accounting principles and internal controls, and apply them. Objective : Over 2 years of experience in management, employee relations, interpersonal communications, written and oral communication; writing professional documents and problem-solving. Skills : PeopleSoft Financials, QuickBooks, CRM Experience, Knowledge Of Salesforce, Quotes, Renewals, Service Contracts, Sales Orders, Pricing. Prepared and presented company quarterly, monthly and annual financial information to management. Conducted analysis of accounting issues including revenue recognition and competitive analysis. Performed reviews of various financial statements to identify financial reporting issues and drove resolution of these issues. Worked closely with other finance department groups - billing team, planning team, revenue team and sales team - to ensure proper data flow and accurate information in PeopleSoft Financials and SalesForce CRM. Monitored credit limits of current customers by analyzing company financial data, credit reports and payment history of client accounts using PeopleSoft financials and SalesForce CRM. Developed pricing strategy for renewing and new clients and performed contract analysis. 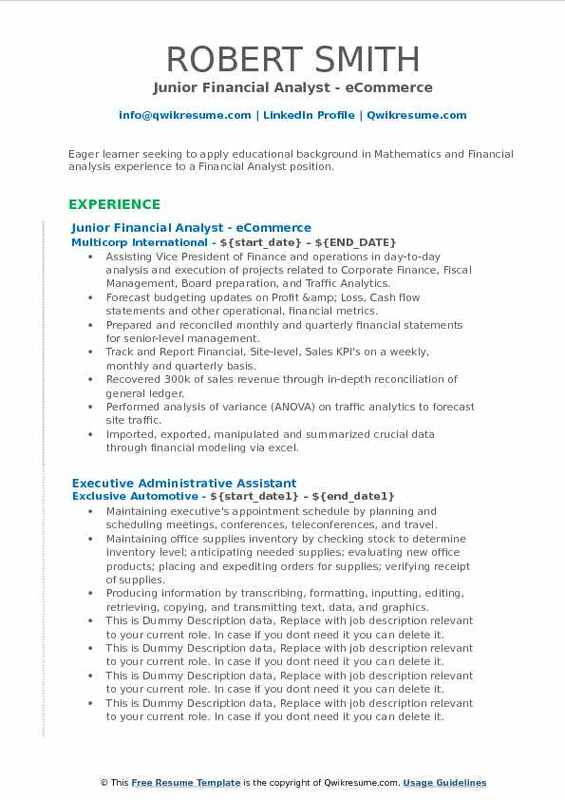 Objective : Eager learner seeking to apply educational background in Mathematics and Financial analysis experience to a Financial Analyst position. Assisting Vice President of Finance and operations in day-to-day analysis and execution of projects related to Corporate Finance, Fiscal Management, Board preparation, and Traffic Analytics. Forecast budgeting updates on Profit & Loss, Cash flow statements and other operational, financial metrics. Prepared and reconciled monthly and quarterly financial statements for senior-level management. Track and Report Financial, Site-level, Sales KPI's on a weekly, monthly and quarterly basis. Recovered 300k of sales revenue through in-depth reconciliation of general ledger. Performed analysis of variance (ANOVA) on traffic analytics to forecast site traffic. Imported, exported, manipulated and summarized crucial data through financial modeling via excel. Executed ad hoc analysis and worked with Sales and IT department as needed on various projects. 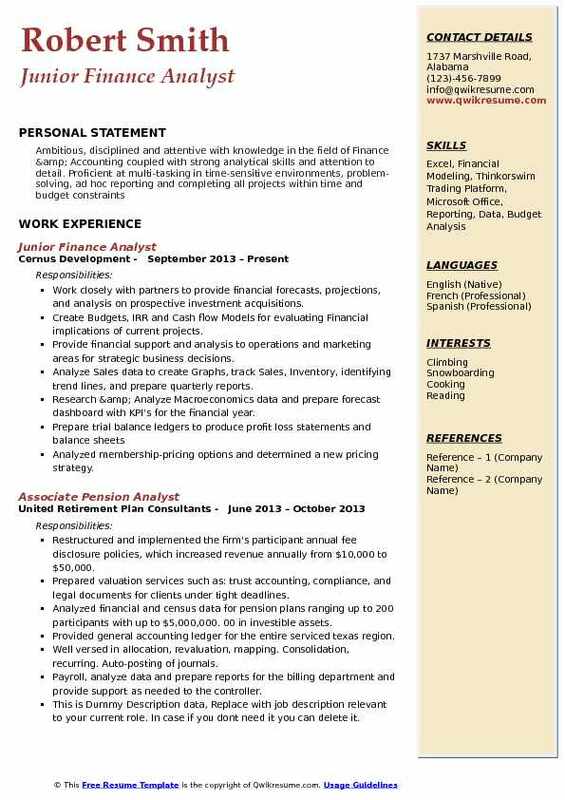 Headline : Experienced professional in Accounting and Finance. Targeting a dynamic organization that provides challenging and rewarding work while allowing me to contribute my talents and positively impact organizational goals and objectives. Assists in the Monthly Accounting, Financial Reporting, and Budgeting process, which includes: Variance Analysis, Reconciliation of Accounts, Reporting of patient statistics, and assemble reconciliation of Budget information. Analyzes and Maintain work papers on assigned Balance Sheet and Income statement accounts to facilitate monthly analysis and ensure an accurate General Ledger. Prepare accurate, adequately supported and adjusting Journal entries and provide support to ensure an accurate general ledger. Assist leadership in completing the documentation and other requirements for ordering equipment, construction projects, and other assets cost of a minimum of $5k. Manage the allocation of maintenance capital Dollars spent for site discretionary funds base on the Annual budget process for that year. Performed Weekly and Monthly Statistics & Revenue for the Hospital that outlines the process of reporting patient visits, average number of beds, actual days, admissions, discharges, and transfers. 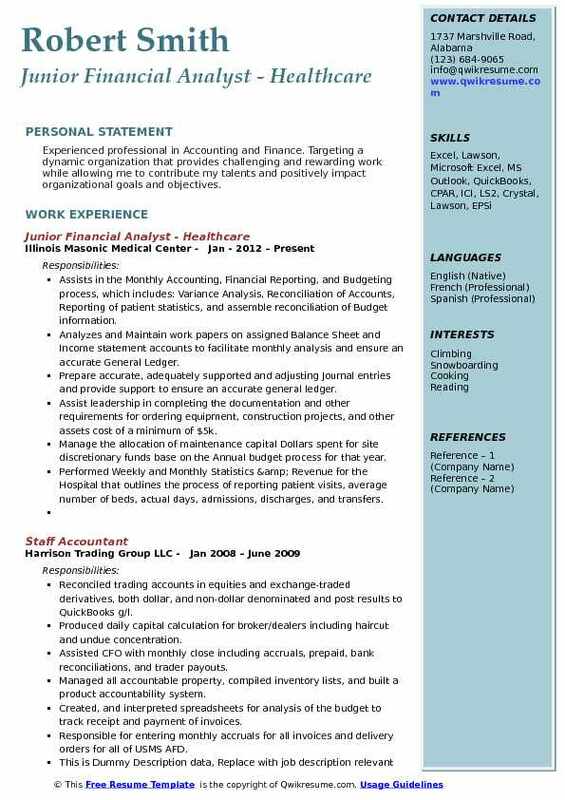 Objective : 3+ years of Experience in Financial Analysis, Accounting, Project Planning, Marketing, event & travel coordination in Health Management and Insurance fields. 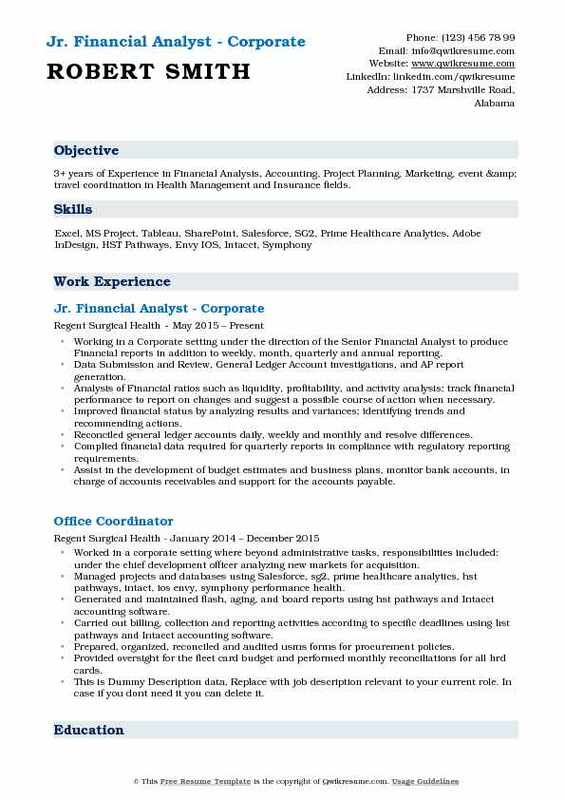 Working in a Corporate setting under the direction of the Senior Financial Analyst to produce Financial reports in addition to weekly, month, quarterly and annual reporting. Data Submission and Review, General Ledger Account investigations, and AP report generation. Analysis of Financial ratios such as liquidity, profitability, and activity analysis; track financial performance to report on changes and suggest a possible course of action when necessary. Improved financial status by analyzing results and variances; identifying trends and recommending actions. Reconciled general ledger accounts daily, weekly and monthly and resolve differences. Complied financial data required for quarterly reports in compliance with regulatory reporting requirements. Assist in the development of budget estimates and business plans, monitor bank accounts, in charge of accounts receivables and support for the accounts payable. Promoted from Intern to Junior Financial Analyst to support the Analyst Team, Director of Acquisitions, CFO and CEO on projects. Duties included gathering and evaluating market data to perform Market Analysis, reviewing portfolio data as part of the project due diligence process, creating presentation and pitch materials for new business pursuits and existing investors. Researched over 100 opportunities (acquisitions, conversions, and development). Determining good investments through market absorption studies, rate analysis studies, and financial modeling (utilizing the profit and loss statement, unit mix, rent roll, etc.). Demonstrated financial modeling and acquisition skills, assisting in the research of over $100M in assets. Focused on market and research studies finding target areas to determine growth capability in the Real Estate industry. 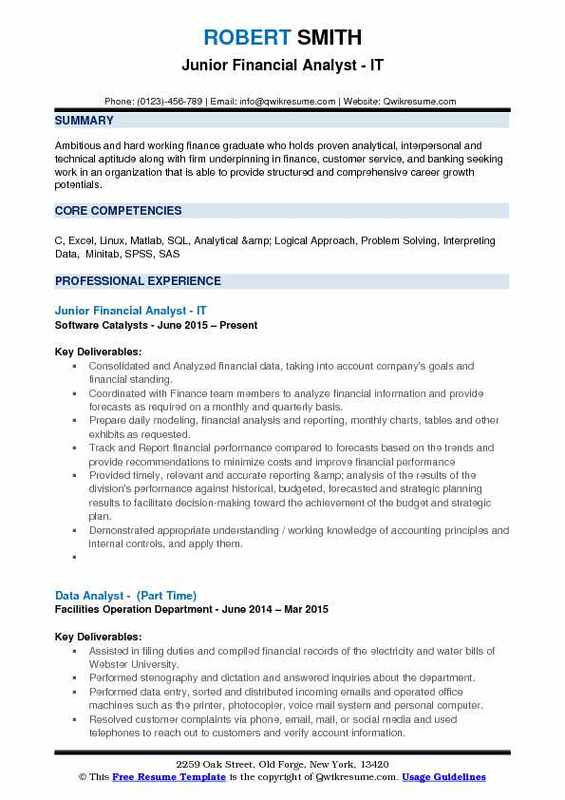 Summary : To obtain a position in the Financial services industry where I can utilize my accounting and Finance knowledge, strong analytical and communication skills, excellent interpersonal abilities and superb work ethic. Provide support to the Senior Financial analyst to ensure daily operations and requirements are fulfilled for a special access Government program. Responsible for payment procedures including creating Invoices, preparing payment schedules, processing and recording expenditures through paying Bills, making Deposits and Wire transfers. Process, record, review and reconcile a variety of financial transactions for numerous accounts. Assist in conducting and maintaining detailed analysis on complex financial data to examine reports such as balance sheets, trial balances and profit loss statements to verify transactions are consistent and accurate in accordance with accounting principles, policies, and objectives. Experience with opening/closing small businesses; registrations, licenses, payroll set-up, and any other required business documentation. Updating expense forecasting for expense accounts based on the current year to date actuals. Work closely with partners to provide financial forecasts, projections, and analysis on prospective investment acquisitions. Create Budgets, IRR and Cash flow Models for evaluating Financial implications of current projects. Provide financial support and analysis to operations and marketing areas for strategic business decisions. Analyze Sales data to create Graphs, track Sales, Inventory, identifying trend lines, and prepare quarterly reports. Research & Analyze Macroeconomics data and prepare forecast dashboard with KPI's for the financial year. Analyzed membership-pricing options and determined a new pricing strategy. Provided financial support and analysis for strategic business decisions and cost saving initiatives. 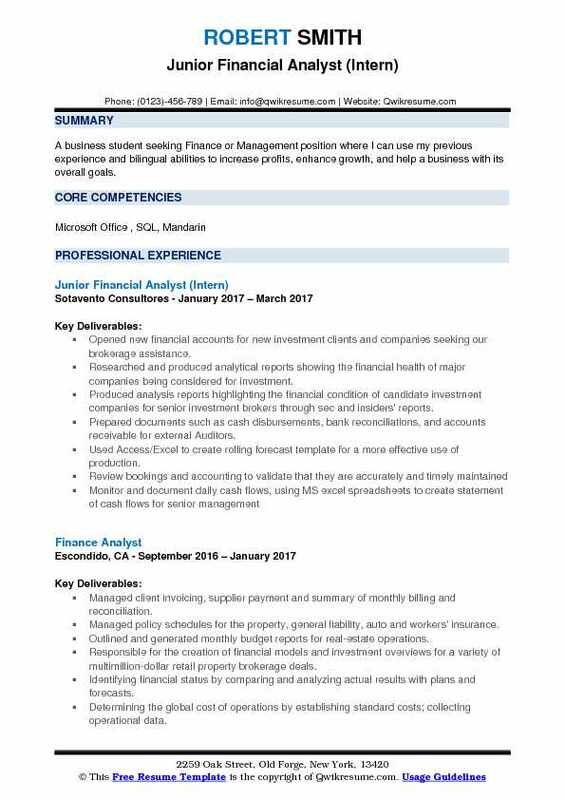 Objective : A recent Finance Graduate looking to obtain a position that will allow me to utilize my communication, organization, and problem-solving skills. Research accuracy of data within the Bloomberg terminal relating to Global Mutual fund markets. Developed and updated current forecasts of currency prices across the foreign exchange market. Implemented a macro to streamline the data entry process across my team, saving an average of 20% time for execution. Classify given mutual funds into asset class; categorize the investment strategy of the funds and summarize them into five line description in order to update Bloomberg terminal. Compile accurate financial statements on assigned municipal Bond issuers by researching Bloomberg terminal utilizing functions like su 1, su 42, bgid, cusd, fa, src. Drafted weekly and monthly stock market reports analyzing the performance of the Cairo and Alexandria stock exchanges (case). Researched macroeconomics and capital markets in UK focusing on London;. Summary : Enthusiastic, driven individual with five years experience in Retail and Sales management. Works well in deadline-oriented and fast paced environments. 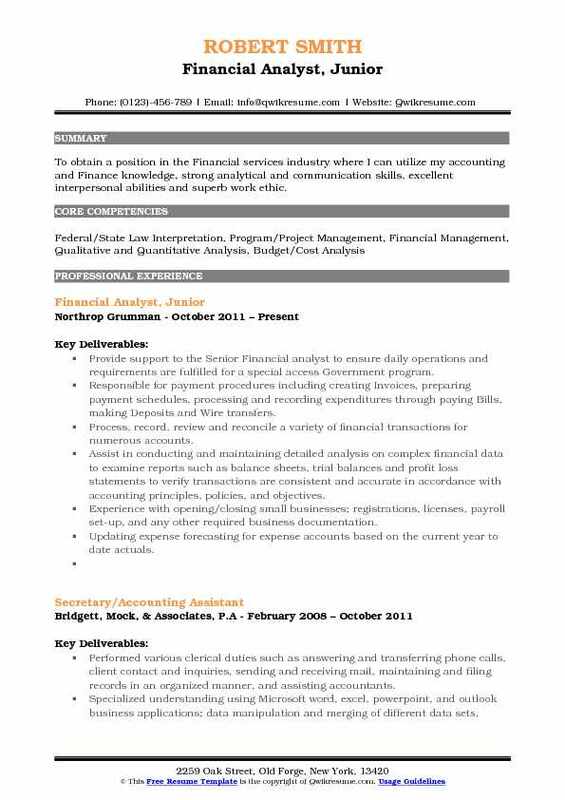 A self-starter, quick learner, and problem solver looking for opportunities to further a professional career in the accounting and finance industry. Analyze monthly, quarterly, and annual commission plans by working with management and sales associates and submitting final commission data to payrolls. Assist management in budgeting, forecasting, variance analysis and financial modeling. Examine interrelationships and trends of differing components to create summary analysis reports using Excel and PowerPoint. Generated reports for budget specific matters and reported to Executive management. 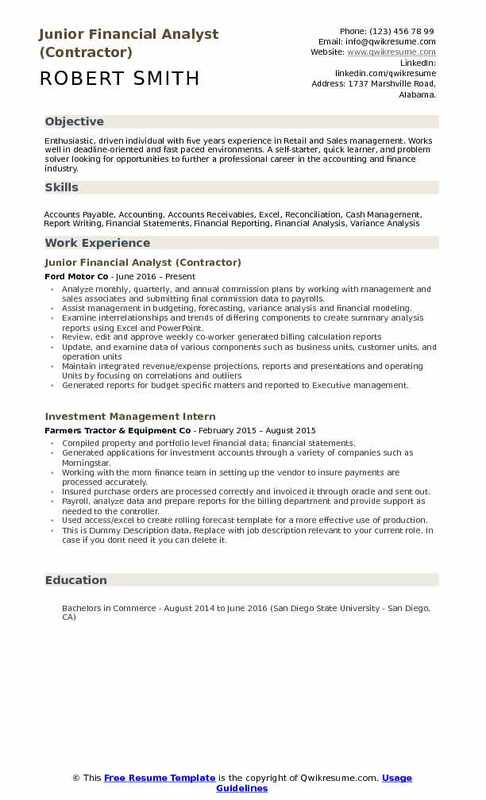 Objective : A business student seeking Finance or Management position where I can use my previous experience and bilingual abilities to increase profits, enhance growth, and help a business with its overall goals. Opened new financial accounts for new investment clients and companies seeking our brokerage assistance. Researched and produced analytical reports showing the financial health of major companies being considered for investment. Produced analysis reports highlighting the financial condition of candidate investment companies for senior investment brokers through sec and insiders' reports. Prepared documents such as cash disbursements, bank reconciliations, and accounts receivable for external Auditors. Used Access/Excel to create rolling forecast template for a more effective use of production. 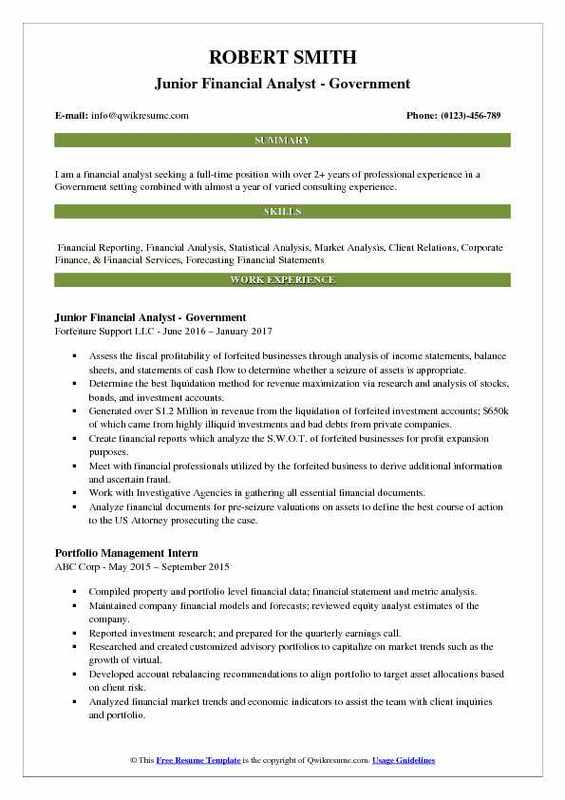 Objective : I am a financial analyst seeking a full-time position with over 2+ years of professional experience in a Government setting combined with almost a year of varied consulting experience. Assess the fiscal profitability of forfeited businesses through analysis of income statements, balance sheets, and statements of cash flow to determine whether a seizure of assets is appropriate. Determine the best liquidation method for revenue maximization via research and analysis of stocks, bonds, and investment accounts. Generated over $1.2 Million in revenue from the liquidation of forfeited investment accounts; $650k of which came from highly illiquid investments and bad debts from private companies. Create financial reports which analyze the S.W.O.T. of forfeited businesses for profit expansion purposes. Meet with financial professionals utilized by the forfeited business to derive additional information and ascertain fraud. Work with Investigative Agencies in gathering all essential financial documents. Analyze financial documents for pre-seizure valuations on assets to define the best course of action to the US Attorney prosecuting the case.